AEP Tanner's Creek power station found that using the latest technological advancements can add years to heat exchanger units. By more accurately and quickly replacing tubes, costs are slashed and service is life extended. When heat exchanger tubes - sometimes numbering a thousand or more per unit - begin to crack or wear, the effects can lead to a cascade of subsequent failures in adjacent tubes. If too many tubes are plugged, heat exchanger effectiveness is compromised, and power generation may be curtailed by a substantial percentage. If conventional mechanical plugs are used, they can break loose, leak and fail. At that point the replacement of a very costly heat exchanger may be imminent. However, if the latest sleeve installation technologies and techniques are used, the results can be lower materials and installation costs, improved heat exchanger performance, without the need to take generation units offline while the repair work is done. Perhaps most importantly, the sleeved heat exchanger can operate reliably for added years, saving operator's capital until a planned rebuilding or replacement unit is installed. At AEP's Tanner's Creek 995 MW station, located on the Ohio River near Lawrenceburg, Indiana, thermal stress cracking and wall loss indicated impending failures of 60 percent of the feedwater outlet tubes in the heat exchanger on the plant's 500 MW super critical Unit 4. This was in the fall of 2009. "We had done some testing and were hopeful that the heater could be repaired," explains Jay King, Process Supervisor. "It was not feasible to replace the heaters at this time. We had to have a certain amount of time to put together a replacement package to present to the board and show that is was justifiable to replace the heaters in the future." "We were at the point where we had to discuss abandoning the heaters until we could replace them. Unfortunately, this would possibly cut down our output because it would not be desirable to operate the heater in each string. This would greatly accelerate the end life of these heaters. To operate without any heaters in service would have meant as much as a 50 MW curtailment," King adds. The two high pressure feed water heaters were eddy current tested and found to have severe stress cracks from the back face of the tube sheet in the de-superheating zone extending approximately six feet to the back of the zone. In order to verify the severity of the stress cracking, a tube sample was taken for laboratory analysis which proved the eddy current test was accurate. It would have been extremely difficult if not impossible to cut and pull a tube sample from these heaters via conventional methods due to the very heavy tube wall thicknesses. However, American Power Services (APS) was able to extract a tube sample using their proprietary and patented advanced plasma arc tube cutter (P.A.T.C.). APS's plasma arc tube cutter enables them to cut heavy wall tubes at any length up to the tangent point of the U-bend in order to facilitate tube sample removal. Since the thickness of the tube walls ranged between 0.083" and 0.115" thick, cutting and removal of a tube sample would be very tough to cut or even access otherwise. "They, came up with the idea of sleeving the outlet tubes to increase the longevity of the heaters and return the heaters to service," says King. "They sleeved all the feedwater outlet tubes that had 70% or greater wall loss and had signs of stress cracking." If the latest sleeve installation technologies and techniques are used, the results can lower material and installation costs, improve heat exchanger performance, without the need to take the generation units offline while the repair work is done. 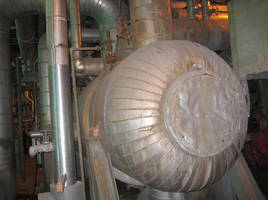 Once the repair work is done, the re-sleeved heat exchanger can operate reliably for added years, saving operator's capital until a planned replacement unit is installed. "At Tanner's' Creek the tube defects were roughly up to 6 ft. back behind the tube sheet," says APS sales and services engineer David Grimes. "Instead of plugging the problem tubes we went in with sleeves that were roughly 7 ft. long and installed the sleeves in the ID of the tubes and the sleeves extended past the area where the stress cracking or excessive wall loss was located. So, if the tubes continued to weaken and fail, then we have those liners installed that should prevent the tubes with through wall cracks from leaking." Grimes adds that APS chose to recommend installing the sleeves because plugging such a large percentage of tubes would have led to reduced thermal performance and increased feedwater velocity in the inlet of the unplugged tubes. Additionally, the plant may have had to cut a bypass orifice in the pass partition plate in order to prevent higher tube inlet velocities that, would have led to further heat transfer degradation. As a result of APS' innovative approach, we were able to sleeve the Tanner's Creek feedwater heaters despite the limited access within the feedwater heater and presence of heavy wall tubing, representing a very substantial savings to AEP over replacement heaters. "I would say that, using this technology, our customers can realize savings of over 80 percent of a the cost of a new heat exchanger if they elect to install sleeves rather than replace their problem heat exchangers," says Grimes. After the sleeving project at Tanner's Creek unit was finished, Jay King was surprised to see that heater performance was substantially maintained. "We would have expected to see a slight performance decay, since you have the sleeves in place in the de-superheating zone," he says. "Because it's now a heavier-walled tube. But that didn't happen. We maintained the same performance levels. The TTD (terminal temperature difference) and the saturation temperature of the heater (based on the pressure) versus the feedwater outlet, have not decayed at all." Quite possibly that resulted from the selective, limited use of sleeving. "The thing I liked best about going this route, is that we didn't have to abandon the heaters," adds King. "That would have presented us with a very difficult situation on how we would start and shut down the unit without some serious pipe modifications and major changes in operating procedures. These heaters are used during start-up and are equipped with alternate drains that drain back to the condenser that must be utilized during start-up. The piping modifications would have meant a large added O&M expense and time lost for engineering to assess needed operational changes. The installation of the sleeves allowed us to maintain efficiency and return the unit to service maintaining a design basis." In installing the sleeves, APS employed an advanced hydraulic expansion method that utilized a flexible hydraulic expansion mandrel. The use of a hydraulic expander provides a more uniform expansion and superior contact of the sleeve OD with the ID of the parent tube. Additionally, the sleeves were strength welded to the parent tubes at the face of the outlet tubesheet. Grimes adds that with projects that utilize the advanced tube testing and sleeving technologies, there are benefits that are somewhat immeasurable. "In most cases, sleeving can be performed with the heater isolated while the unit remains online which allows the Utility to continue to generate electricity. The power generating capacity that these companies retain, as well as how much more heat transfer they are able to get out of that heat exchanger are additional cost savings that the utilities realize from this process. So, you would have to calculate that and how much less coal you would have to burn to maintain the same MW. Plus, the capital expenditures have to be considered regarding heat exchanger replacement."